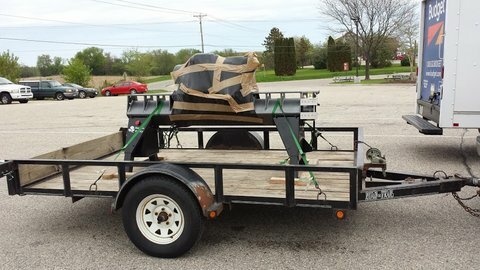 I drove over to Barneveld last Monday and picked up my new American Beauty lathe. 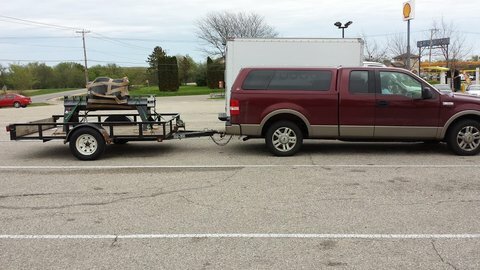 After talking to Brent and Deb I decided the best option was to pick it up fully assembled so I took my trailer over behind my 2004 F150. 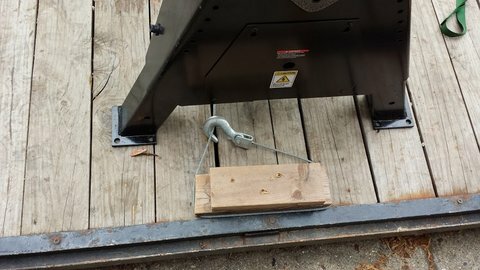 To secure it to the trailer I screwed some 2x4s down to capture each leg, and then tied it down with some ratchet straps. 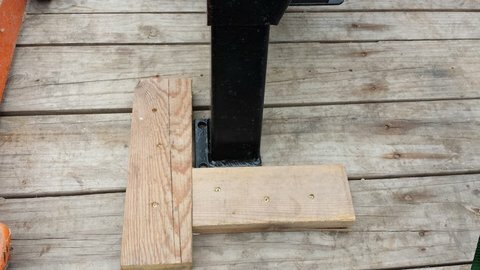 I was bent over the end of the trailer driving screws into one of the 2x4s when I felt something move in by back. CRAP!! It wasn’t as bad as sometimes but it hsn’t been fun, either. As soon as we started rolling towards home my wife called the chiro on the cell phone and made me an appointment for this afternoon. 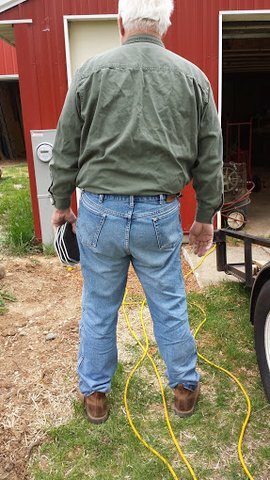 This is me from the rear after a visit to the chiro, an Aleve and about an hour on the ice pack. My wife says I normally stand up straighter than this. The challenge after we got it ‘home’ was to get it into the shop. 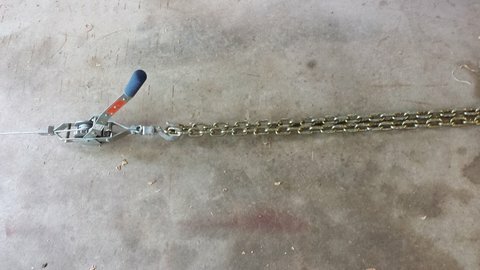 So I dropped the trailer off the truck and hooked it to the tractor, and backed it up to the shop door. 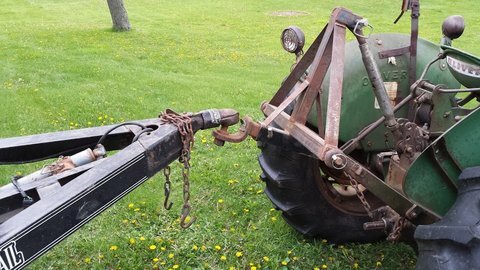 I raised the hitch on the tractor as far as it would go. 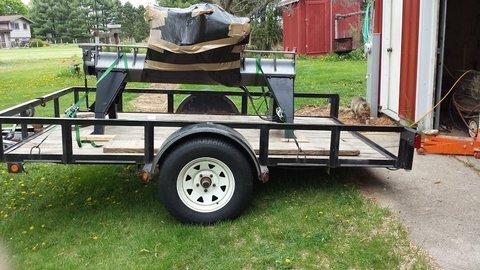 But, I still lacked about 6 inches of having the back end of the trailer on the ground. 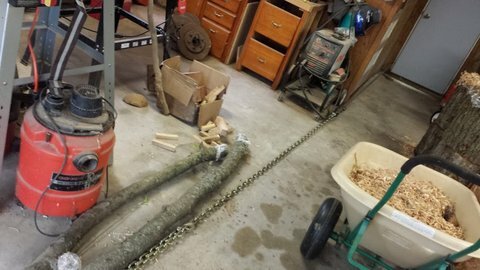 So I thought getting the weight of the lathe behind the axle might help. 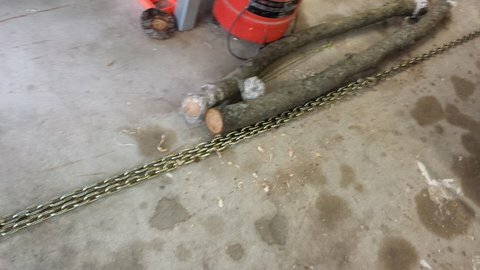 So I screwed a couple of the 2x4s to the back of the trailer to loop a come-along cable around, put a 4×4 across the other end of the lathe and stared moving it backward. 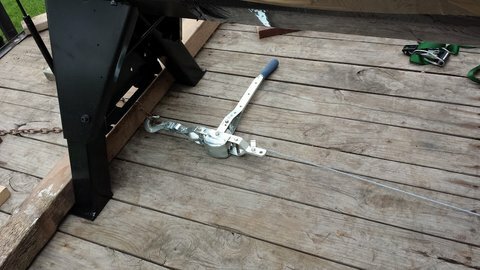 Until the legs of the lathe hit the metal lip on the rear edge of the trailer. 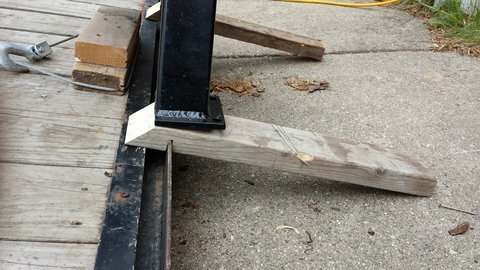 I levered the legs up over the lip and created a couple little ramps from 2x4s to slide the legs up over the lip which sticks up above the floor of the trailer about 1/2 inch. 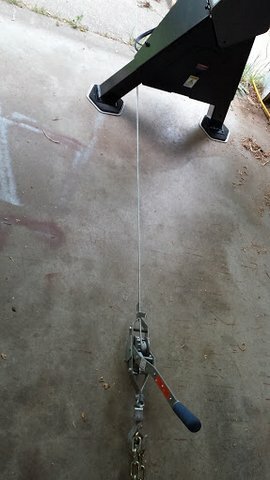 This served to get the rear legs over the end of the trailer and down to the cement pad that is in front of the shed door. to another 4×4 across the rear door of the shop. 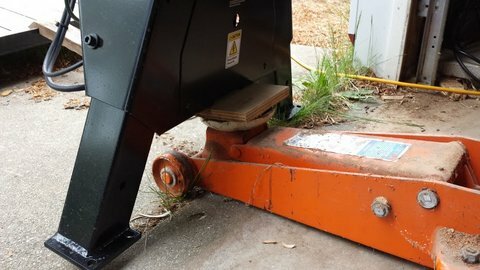 Also, we could now put a floor jack under one end of the lathe and steer it a little bit. 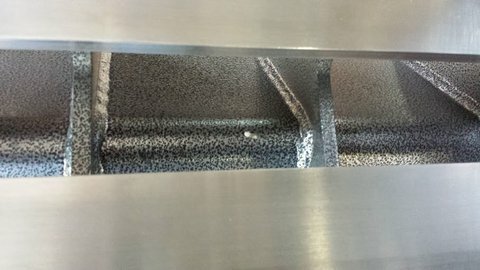 So we got it into the shop and unwrapped the plastic from around it, and looked it over. One of the disadvantages of bringing it home ‘al fresco’ is apparently a little bird used it as a temporary roost – that white spec you see below is bird poop. Also, we ran through some light drizzle on the way home, just enough that I will need to wipe the paint down to get water spots off it. 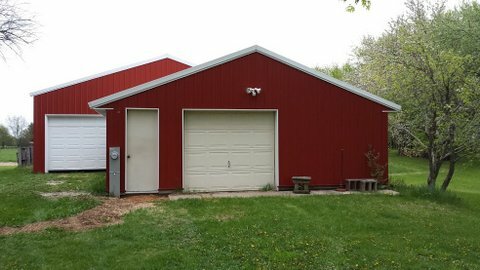 It’s in the shed and out of the rain (we’re getting thunder and lightning as I write this). 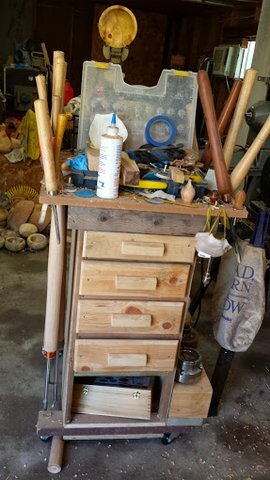 Tomorrow, or whenever my back feels up to it, we will shove it back into it’s permanent home, which will be in the corner where the bandsaw now is. 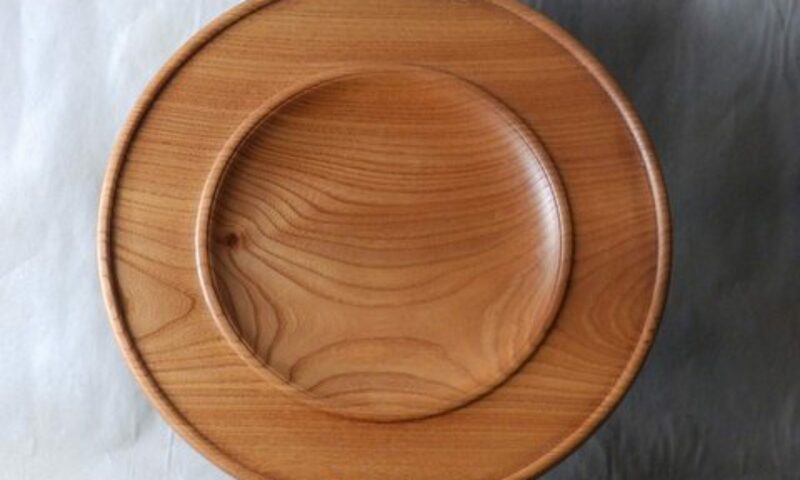 I think I am going to try to get the OSB painted before I do that, and I need to change the plug where I have the bandsaw plugged in so I can plug the lathe into that outlet. 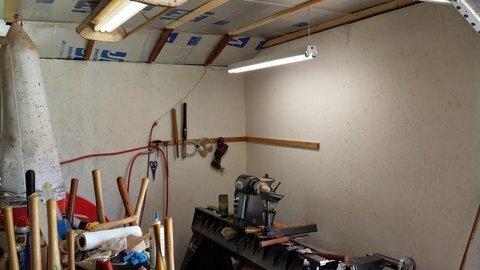 On Tuesday morning I got the walls painted in the corner where I want to put the lathe. 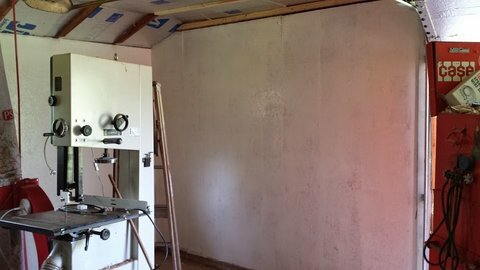 Here is the wall with the first coat of paint drying. 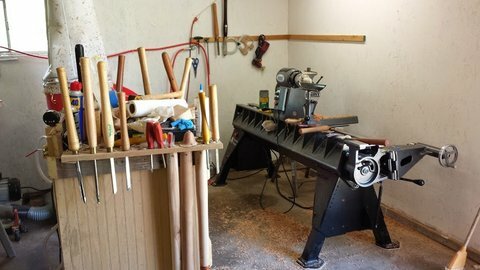 Then later I got the lathe shoved, pulled, pushed, moved – whatever – back into that corner. 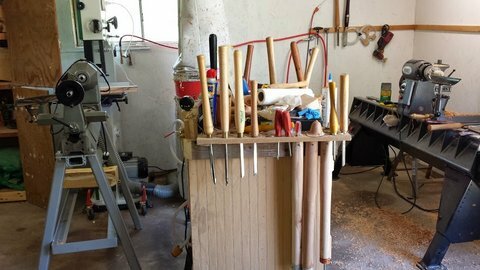 And, yes, I have even managed to make a few shavings with it. I even have a piece that I completed start to finish on it, but I don’t have a picture yet because the poly is drying on it. 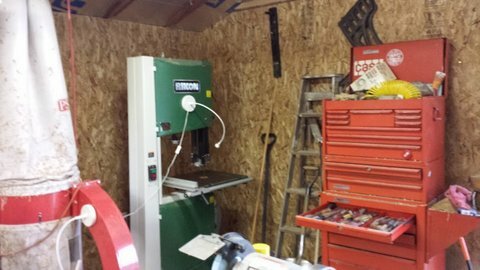 I turned the dust collector a quarter turn and moved the band saw to where the Nova sat.Those are in the background behind the tool cart and the Nova lathe which is pulled out from the wall. 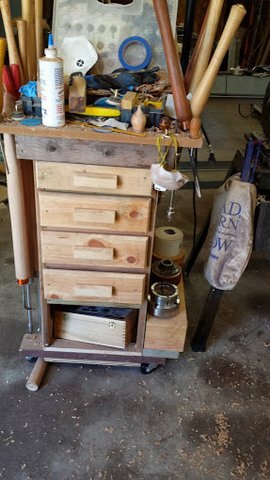 Here are a couple pictures of my tool cart (for the lathe). I cobbled this together in a fit of frustration one day last year, but it serves me well for the most part. If I could just learn not to pile on it every little thing that comes to hand.